It is being reported this morning that Eurostat will rule that the State funds spent on Irish Water will have to remain on the Exchequer balance sheet until at least 2017. 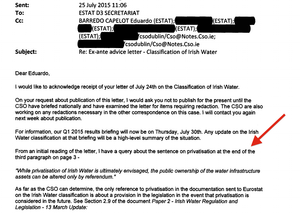 Posted in Misc and tagged Eurostat, Irish Water at 10:15 am on July 28, 2015 by Broadsheet. Amazing. Everyone is a loser now. Yes, but they’ve socialised the losses and privatised the gains, so not *everybody* is a loser. Well done to the water charges protestors. Their efforts (and tha capitulation of the govt) have ensured that this cost be on our balance sheet. 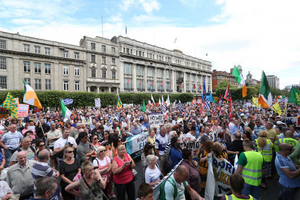 Some might feel that this is good – makes it more difficult for the govt to hide such activities – but they tend to be a bit more right-wing than the typical anti-water charges protestor. Bullsh*t. The government setting this up as a cash cow for their friends, cronies and donators after promising new politics and transparency to a fed up public is the cause of this clusterf*ck. That is an interpretation and a fair one (although I personally think it is nonsense). 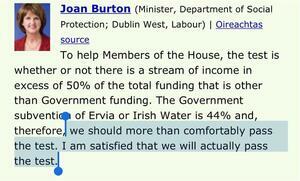 However, the immediate cause of the off-balance-sheet-issue is the govt bowing to water protestor pressure. It’s funny, this will be spun as the fault of the government. It’s certainly bad news for them. The worst thing about IW – the fact that we have meters but no incentive to reduce consumption is down to people refusing to pay and their political cheerleaders. Ditto this problem. IW would not have failed the test if people had paid their bills. It’s like knocking someone down with your car and then complaining that they’re such terribly slow walkers. Why was it a shambles? How was it different to other utilities, bearing in mind the transition that was required? With Tierney at the helm of a crew largely selected because of who they knew or were related to rather than actual qualifications to do the job, and the leaking of bonus plans, and the exposure of Dinny’s special interest in the company, and all of the rest of the keystone cops style of incompetence demonstrated by the company to date, it was a shambles from the word go. It was a shambles, and it remains a shambles. To try to deny that it is anything other that a shambles is hugely deluded. and on and on and on, and this is all before we get into siteserv, which is the main reason I won’t pay.. IW is a total job for the boys all around. If you haven’t read this, you should.. Despite the problems, many of which are real, people should really pay their bills. All these bungles are excellent cover of course for people who dislike paying for things, that’s certainly true. You’ll find everybody likes paying for things, but some are more discerning than you when it comes the value that they expect in return. But Justin, the point is that if we pay bills we’re tacitly saying to the government and to Irish Water ‘Crack on lads, we 100% approve of what you’re doing and how you’re doing it’. I believe in water charges. I DON’T believe in condoning cack handed management and pig-troughery. The only way i can register my disapproval is by withholding payment. ivan, the protests are bot about how IW is run. They are about having to pay. They are about pretending that we don’t need top face up to real problems, nor pay our way. It is a similar problem we have with the health system – we don’t want to pay for it, we don’t want to make a trade-off between local and quality services, we don;t want to engage with the difficult questions of HOW we do it better. and soon we would be paying €1,000 a year so that the iw staff can collect over inflated salaries. Anti-water? I wasn’t aware that there was an orchestrated campaign against water. Good luck with that. What a mess. Total GUBU. This is pretty big. By trying to make the Water Charges more politically acceptable, they’ve actually burdened the State with Irish Water as part of the State finances for a few years to come at least. Less money for hospitals, schools, tax cuts or whatever. Disappointing. We pay a pittance of the cost, so if you’re happy that we do pay, but can recognise that it is not enough… let’s just quintuple the car tax ! We pay enough to keep it tipping over where we lose 50% of the water treated or have areas which have boil notices for 7 years. This is the system Zuppy wants to keep. 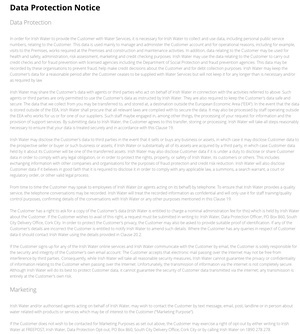 It seems anti-IW people are happy to pay….they keep telling us that they pay, all the time – but content to not really pay enough and have a poo-ey system. The idea that we could continue to pay AND (God forbid) pay enough AND leverage those payments to pay for a really good system AND use meters to reduce our water use, is a foreign language to them. Proof of your claim Vote Rep 1? Water is the most recyclable element on the planet (the sun dos it everyday for free) and that 50% of water lost only became a meme in the run up to this privatisation disaster. Besides, where have the billions we already paid for water over the last decade and a half gone to? Why was it not invested in the water system? Why, instead, have we paid billions to socialise the private debts of the criminal bankers and yet we allow the banks to kick ordinary people out of their homes using the Gardaí as their bully-boy corporate enforcers in many cases? Come on Blueshirt shills, get out your taking points and call me a conspiracy loon as you try (and fail) to ignore the rotting corpse of the elephant in the room. All States steal from their people. That’s where we’ve been going wrong all this time Zuppy. Not using the sun to clean and transport our water. We’ve been using actual drinking water and waste water technology to do it, like mugs. Total bollox. The 50% lost came to prominence when there was two big freezes which caused lots of pipes to burst and for water to be repeatedly cut off as people kept the water running to stop their pipes freezing. 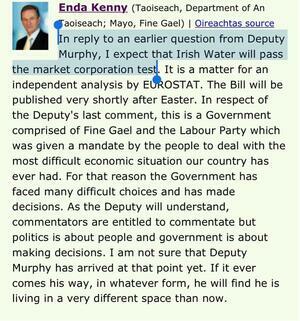 Thats when DCC repeatedly stated that the water works in Dublin were fecked. It was well before IW. Zuppy – if it is so easy to recycle water, why not do it yourself. Harvest rainwater, recycle it & ignore Irish Water altogether. IW owns the rainwater doncha know? @Zuppy… the billions we’ve spent Zuppoy is gone. The problem IS that big, but you carry on with your head in the sand. Believe it or not I have a well. I’m not sure I do believe that you have a well, Zuppy. Where does your waste water go? i.e. how does your water become recylced? Indeed, we already pay for our water. We can only surmise that the current route can only lead in one direction… privatization. I don’t support privatisation, however I reckon we are more likely to end up with privatisation the way we are going. All the efforts of protestors has been to avoid paying any money. No efforts have been put into how IW should be run, how we should structure pricing & how we might safeguard IW. This govt may well lose the battle on water charges eventually but the essential problem of an unfit water supply system will remain, the problem of pricing & protecting water in a world where it is becoming more valuable will remain. Either we come up with a sensible means of doing so now or a a future govt may have no choice but to push this into the hands of the private sector. Shush, no one wants to hear that! What else do what not pay for that we do pay for but actually don’t? I don’t pay inequitable, regressive poll taxes for capital projects if I possibly can avoid it. “Off-balance sheet” is a load of me hoop and you know it. I’d pay more under a progressive taxation system – fair enough, but I won’t buy into a system where a single mother on benefits paying the same bill as Michael O’Leary. It’s not paying for the water you use, they’ve scrapped that, it’s paying a flat fee to rebuild a network – you wouldn’t support the building of schools on that basis. And the fact that the entire system has been designed for privatisation after we’ve tarted it up for Veolia or some other vulture. They have (temporarily I hope) scrapped the ‘paying for the water you use’ in order to mollify the anti-water charges protestors. It seems ratehr unfair to use this as a reason to argue against metering and paying for water in general. It’s all six of one and half dozen of the other – the previous system wasn’t paying for maintenance and supply for the water you use, it was to be invested in rebuilding the system. That’s not a utility charge, it’s a flat tax for a national capital project. We don’t build hospitals and schools by charging a flat tax on rich and poor, same should be true for a new water supply and distribution network. It should from day one have been a real charge for actual use, and a completely separate exchequer funded project to rebuild the network, conflating the two made the charge by definition a poll tax. This was all “Dublin Says No”‘s master plan. They’re not only anti-water, but anti-healthcare too. Joan’s brother in law. I’d question her if she told me her second name was Burton. 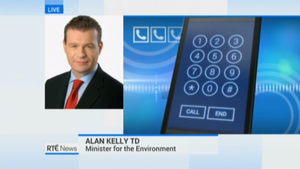 Just stick the rest of those water metres inwith them ouls e-voting machines lads. Now, what’s next? …. and the medical centres of excellence, free GP care for all (what a nonsense that one was) the banking enquiry, Seanad reform. Shambles. Puppets and ones with heads falling off at that. Just make sure his Dinnyness gets his money. They need to immediately stop IW borrowing money. IW are borrowing at higher interest rates than the state right now – that’s apparently fine if it’s not on our balance sheet, but now that it’s on the balance sheet and staying there we’re throwing money away by letting them borrow at higher cost than the Exchequer when it’s all now one and the same. Well they have to pay for those bonuses and for those useless water meters somehow. The only problem is our elected morons are gone on holidays so this story and your point will die and disappear. Happy days for the boyos! This nonsense will henceforth be known as: The Battle of Omnishambles commanded by General Clusterf**k.
BellEnda, Noonar, Brutal, Sinister Kelly, Howling and all the other Blueshirt/Labour muppets have no mandate, no standing and no honour. They should do the decent thing and resign. And take that hobbit in the park with them when they go.